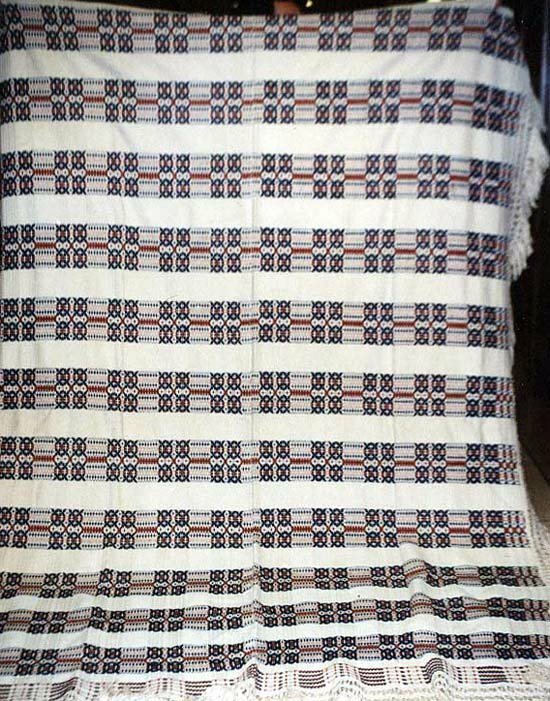 Seemingly more cotton than wool, this handsome coverlet has wide horizontal bands of natural cotton alternating with tweedy bands mixing red and blue geometric figured wool. This is a wonderful bedcovering for any season, lighter in weight than a double-cloth or all wool coverlet The majority of the weaving material is white cotton rather than wool| creating a lighter look and weight to this handsome coverlet. Red and indigo wool create an intricate pattern arrayed as horizontal stripes. Woven in two panels| original fringe woven out from the borders. IN PERSON COLORS ARE SOFTER RED AND RICH INDIGO|NOT AS SHARP AS IN PHOTOS| WHERE I HEIGHTENED THE CONTRAST TO EMPHASIZE PATTERN.